Design different types of greeting cards with the use of image designing objects like text, ClipArts, Signature, Wordart, Barcode, Shape Type and Insert Image. Now you can easily design mulitple greeting cards with different barcode and text value using Batch Processing Series feature of Greeting Card Maker Software. Greeting Cards Designer Software easily generates Greeting Cards with advance print option in easy to use graphical user interface. Software is a complete solution for all of your Greeting Card designing and printing needs. 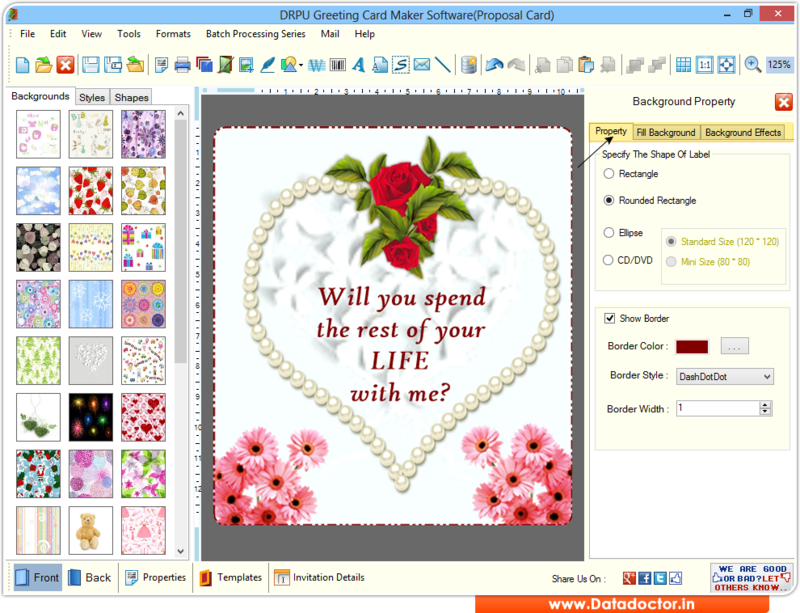 » Card making software creates customized cards using card designing objects including Text, Ellipse, Rectangle, Line, Pencil, Arc, Picture and more. » Design customized cards with option to change created greeting card Font, Color and Image settings. » Software provides E-mail setting feature to send generated cards at specified email address. » Creates multiple greeting cards simultaneously for different users with different barcode and text value. » Option to print created cards and labels using advance print setting option.